Hello Fabricworms! How's your February going? If you're on the east coast, I'm so sorry for the terrible weather you've all been having. I hope this week's giveaway makes you feel a little happy because this week's giveaway is for more Moda. 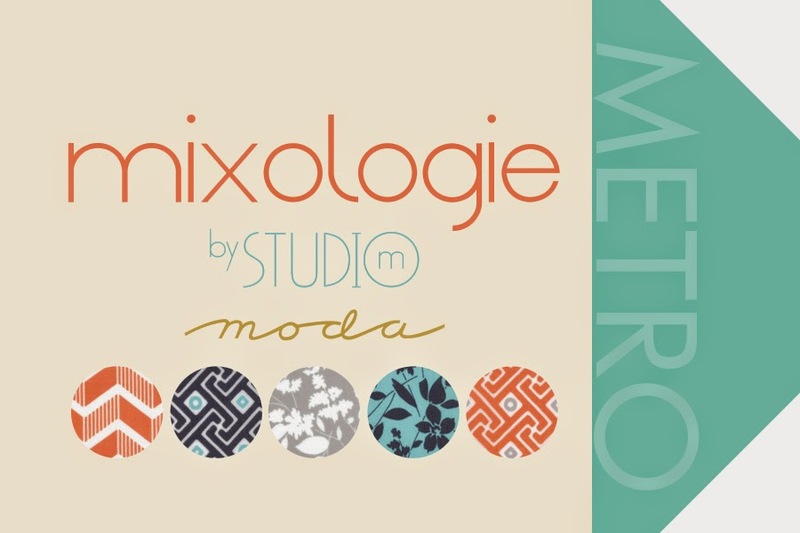 This week we will be giving away a free fat quarter bundle of Mixologie by Studio M for Moda. Enter to win! Chic and stylish, Mixologie blends a variety of modern essentials with a cosmopolitan flavor in a fresh color palette that is contemporary, yet classic. Available plain or in a variety of must-have cotton linen prints, this collection is versatile and ready to mix up some style! This giveaway ends on Sunday 2/8 @ 12 pm PST. The winner will be contacted shortly after by email. The winner will be chosen by randomly through Gleam. I would love to make some comfy pajama pants! I love seeing nice black quilting fabrics! That would make fantastic organizational bins! love all the fabric you guys have!!!!! im an every day sewer and would love to have it all lol. Hi, Thanks for a great giveaway! I'd make a new robe for my sister! The widget is a bit behind on the giveaway...it thinks we're still on organic fleece! I love these Moda prints though, they would be amazing to mix and match for outfits for my little ones. I would love to make a quilt -- the one you showed in the photo is just gorgeous! I would make a linden sweatshirt by Grainline Studio. ooops made a mistake on my fave colour post, should be "Jan". thse colours are fantastic! I love the blues. I would make my new grandson a baby quilt. I really need to make a bag for my scooter helmet and it would be perfect in pink! But could make sooo many other things too. Fabric is wonderful - love those colours together! I would make a darling little baby quilt. I love the aqua blues. This fabric is really pretty, would make a beautiful quilt! You still have organic fleece under the Pinterest tab! I would start to make a quilt. I love all colors green, but I could add some of these colors in the mix! LOVE this color combination and have at least two patterns in mind for it! Question asked what would I do with organic fleece - easy - make a long sweatshirt. I'd either work on a quilt for a family member (or 2) or make pajama shorts/pants. Either way, something to be comfy cozy in! My favorite color of fleece is blue or purple. I love them both! I love love love your fabric! Want to win so bad! I would make a cute dress for my baby girl and blue is my favorite! Love the fabric and would make a beautiful modern quilt. A pretty color like blue or purple to make a blanket from. 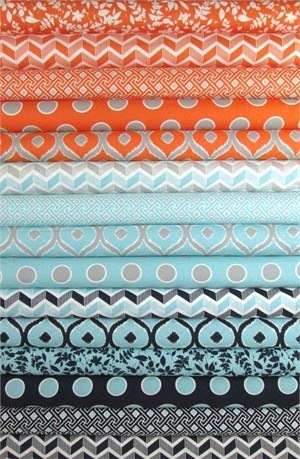 I'd love to make a quilt with these fabrics! Although, this asked what I would do with 3 yds of fleece...I'd make some comfy pants with that! Oh I would love to win this fabric. It would match my decor perfectly !! I'd make a throw for my niece and nephew whose favorite colors are blue and orange. I would make soft baby throw. I love the colors here. My favorite combo!! I would love to make a quilt from this. Hmm, if it's the organic fleece, then a snuggly pair of pj's for my 2yo daughter in sun and sky - her favourite colours. If it's the new mixologie FQs then a baby quilt for our little bean, yet to be met! Love this fabric!!!! The colors are gorgeous! I'd make either some nice pajamas for my little one or a soft and snuggly quilt backing for a baby quilt. Would LOVE to win to make a blanket! I would love to make a blanket. What a wonderful bundle of fabrics, perfect for a teen girl at the Ronald McDonald house in Seattle! The Mixologie fabrics are so pretty. I would love a quilt with them. With the fleece, my color is teal & it would be the start of a blanket/quilt. For the Moda quarters I would make a backpack/tote. Love this fabric and want it badly! I would make some pajamas. I've been favoring teals lately. Thanks! I'd make a blue dog bed. Love the colours and print designs... Perfect for a bed runner!! I would love to make some pajamas with it. Pink is my all time favorite color. 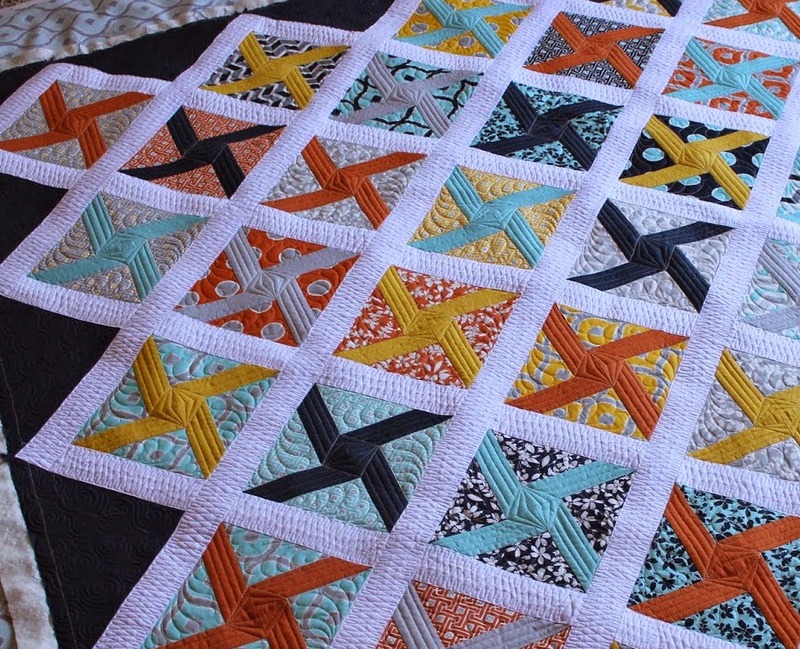 I would make a stylish quilt using a combination of the orange and sky blue colored prints. So gorgeous! Set of baby ties. And pants. These colors would look great in my new home! I love Moda fabrics! I would love this win - what wonderful fabric! LOVE this fabric!! These colors are pretty well perfect for what I have been looking for and gathering for a quilt! Beautiful! I like the oranges best although I like them all. I so badly need this fabric. I would use the fleece for a backing on a baby blanket. My favorite color is purple...any shade will do! Love the fabric....sooo many possibilities!! Love this fabric. I see pillows and light coverlet for spring. I just love the blues! I would make a purse with it, so I would get to use it and see it every day! Love the dark blue and orange together! I would definitely make a quilt with this bundle! Thanks for the chance to win! I go for blues, the darker the better. I would probably make some toasty jammies. Superb giveaway of gorgeous fabrics, I'd use them in a quilt for me! Jammies for my daughter. I live in Puerto Rico and she's in the US. I love greens. I love the orange and the blue fabrics. If I win.. I'd love to make a patchwork purse. I love love love the color coral and would make some yummy comfy cushions out of 2 yards of coral fleece, with embroidery - probably something peacock related. I would make a green fleece top. Love this fabric! Would make a beautiful QAYG Strip quilt like Maureen Cracknell is making. I just saw the laptop sleeve on this page. I'd like to make one with the two yards of fabric. I like fleece in all shades of and patterns in beige. I'd make a quilt. My favorite color at the moment is aqua. I would make a nice blanket. I love blues. I would use any color organic cotton fleece as a backing for a Mixologie quilt for my bed! I'm in the freezing cold snow belt of NY - this would be the best quilt to have! I'd use the fleece for a quilt backing - maybe blue?? Love the color combo. It might work with the applique pattern I am interested in doing. I'm not sure what I would do with fleece, maybe some pj pants for the family! Thanks!I love blue, that's probably my favorite fleece color! I would love to make a handbag. My favorite color is teal in regards to the fleece. Orange is my daughter's favorite color so she would swoon over a beautiful dress using these lovely fabrics. Beautiful fabric. I would love to design a quilt for this material. Love the orange fabrics! Thank you for the giveaway! Beautiful fabric for a beautiful quilt for my daughter who wants to move out very soon. so so pretty! i love the orange!! A warm and comfortable lounging outfit would be great, in blue! What a lovely packet of inspiration. The wheels are turning along with some magical thinking that I really could win. Crossing my fingers and toes and clicking my heels 3 times for extra good luck. Grudgingly, good luck to all. Love the bright colors and would make something for the grand kids. I'd use it as a backing to make a blanket/quilt warmer! These would make a great quilt!! 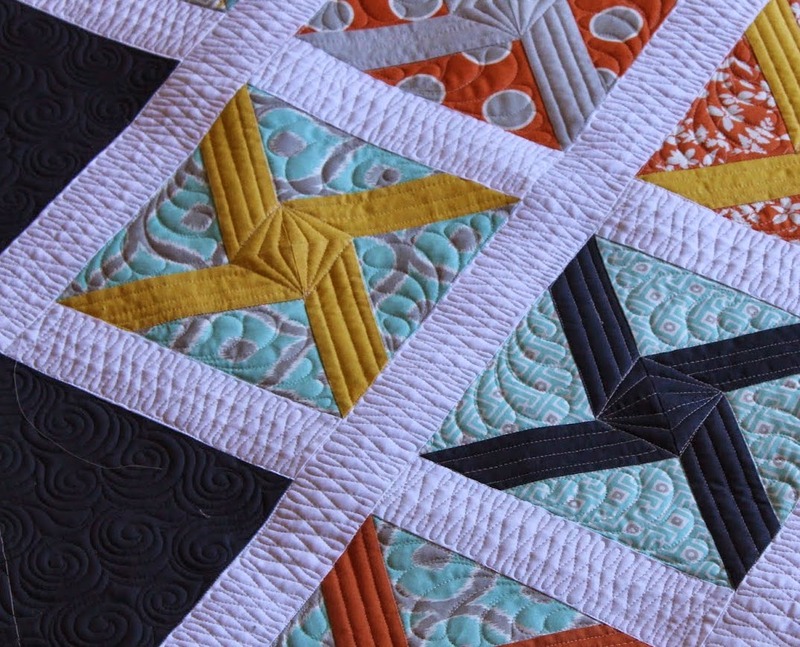 Love the quilt made out of this fabric, and LOVE the quilting on that quilt! I would use this to make quilt tops for World of Charity Stitching. Beautiful!!! Could sew an awesome quilt! I would make pants for my kids. Their favorite colors are purple and red. Live e bright fresh colour combination. Great color combo. Will make a fun Pouf for a granddaughter. Oh what shall I do with it?! I would sew myself a knitting needle case for starters! I see several aprons just screaming my name from this fabric!!! I love the blues. I can see myself creating a quilt or some skirts for my daughter. This is a great collection and the quilt is amazing and beautiful, can I make one like that. I would feature this bundle in my next sewing tutorial! Super adorbs! These belong in a quilt! PJs! I can't keep my grandkids in PJs. Thanks. Favorite color blues. Just found this website I am totally in love and am so inspired! Would love this FQ bundle for some home organisation DIY! Fleece would be perfect for pyjamas for my child and me!